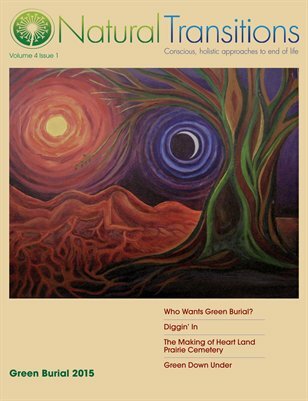 Natural Transitions Magazine, Vol. 4. No. 1 Green Burial 2015 takes a look at the movement for environmentally friendly burial. We hear from conservation burial pioneers such as Billy Campbell of Ramsey Creek Preserve, SC., about how he sees how the movement has evolved, even over the last few years. Other movers and shakers in the natural burial world, Cynthia Beal of the Natural Burial Co, Joe Sehee, of Green Burial Council International, and Rosie Inman-Cook of the Natural Death Centre UK share their perspectives. Newcomers like Sarah Crews of Heart Land Prairie Cemetery in Kansas elaborate on their more recent green burial initiatives, and Jhae Rhim Lee, aka, the mushroom lady, gives us a peek at the latest phase of the Infinity Burial Project, as Dennis White volunteers to test her mushroom burial suit on his demise.